Submitted by Jeff Buster on Sat, 07/04/2009 - 00:27. Autos have, and are, destroying Cleveland. 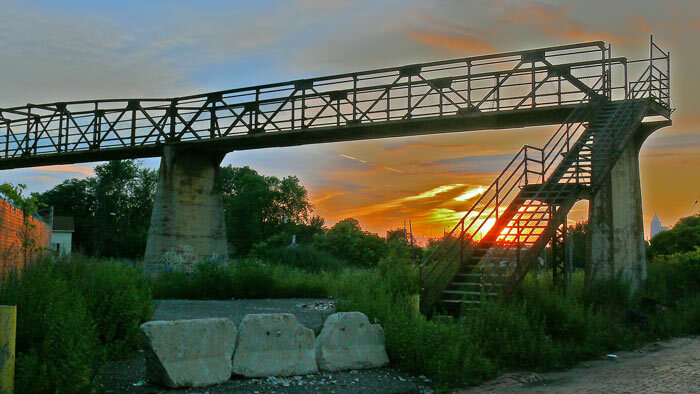 This pedestrian bridge used to join neighborhoods over active rail road tracks. The bridge is still passable, but the tracks lack activity, so why hike up the stairs? Submitted by None on Sun, 07/05/2009 - 00:27. If objects had feelings, that one would say, thanks for noticing me. Nobody would give that bridge a thought, nobody but a few kids that more than likely found it and play on and around it. It’s crazy the number of bridges and tracks that exist, the cost to maintain them and the lack of that actually even happening. If you tried to find who owns that bridge you would or could spend endless hours getting no place. You would be told all sort of weird things to avoid and get away from the conversation. If a person is responsible to maintain that bridge…who would that be? Then if they decided; which never would happen; to work on it; would it require it to be ADA compliant? So then any money spent on it would that then require a ramp and paved path to it? That before anything else? Every bridge every road as defined on a map, with a clickable link to data, the year it was constructed, engineering specs, any connection to a proposed project or area plan. Who is responsible and then a contact. Tiered linked information. Then queries could be done on such data; as to total the maintenance cost of bridges in a defined area. Then alternatives, what if half of them were removed? Is there an alternative design? Could it cost less, would it reduce cost over a longer time? Currently we choose to ignore them, watch as some will eventually collapse because of that. We are supposed to be looking at rail as an alternative, it is more cost effective and uses much less energy. All trains are electric, even the diesel locomotives are really electric, the diesel part is a generator that powers the electric drive motor. Logic would say that all of the power grid and electric rail lines should align, seems that a train without the diesel fuel and generator would be more efficient. Light duty trains and then heavy duty trains. Tracks could redesigned to virtually last for hundreds of years. People do not get it do they…you can still have a personal transport when needed. But people are over doing it, using a 5,000 lb machine to get to the corner store. If you lived in a defined planning district, how much of that should be dedicated green space? Ten percent? Twenty percent? Should it be continuous space? Should it offer water retention and naturalized water filtration methods. Should it connect to other bodies of water, should it connect to other districts green spaces? The metro park is interesting, could the necklace be larger and more elaborate? I say yes it could and the commercial rail could be consolidated and open large tracks of land that inherently connect to other areas. That’s about an advancement in commercial rail logistics, it is about nationalizing the tracks and switches. Then leasing the tracks and use of the consolidated logistical support. The department of transportation shifting to rail and aligning with the department of energy. Transportation corridors that connect clusters, the clusters are were the energy is coming from or going to. Its a grid, concentrations and of public works infrastructure. Could as much as 25% of the land be protected and redefined natural spaces? Were the rain water goes, then all the other structures as grids are trunks and roots. Section by section all rebuilt and restored and or upgraded. The stratification and supply lines, the rings from the clusters out. Submitted by Jeff Buster on Sat, 07/04/2009 - 11:15. Whenever I see man made objects or constructions which have been allowed to decay, I feel that the team of people that constructed the object are getting a slap in the face. If you have ever built something - like either of the two pedestrian bridges recently posted to Realneo, or made bread in the kitchen - and then left your creation so others could use it, it is an insult to return and find what you produced has been spit on and abandoned. Yes, the builders of these structures are probably long dead, but that just exacerbates the insult in my mind. Just as the living show their respect for their species by taking care of the maintenance of the grave yard for the dead, (and the grave yard has little pragmatic function other than open space), so should the living continue to respect - by maintaining - the hard work and design ingenuity of their predecessors. I believe that allowing these important built structures to rot in our plain view is a sign of our deteriorated society and government. We have lost our feelings…and we have lost our respect for all the investment people before us have made in our behalf. Submitted by lmcshane on Sat, 07/04/2009 - 19:16. ...who can't really be bothered to do it, hence the "Opportunity Corridor." Walking is such a quaint concept and one of the favorite mantras of our local green politicos, mostly folks who actually live in God's country aka Geauga County.